ALADDIN (see update below) - DESERT PASSAGE - take a journey through desert lands ; you enter through the Morocco Gate or the India gate and are transported to the open-air markets of Morocco, Arabia and India ; wander through the Lost City and Sultan's Palace; at Harbor Village. you'll find a floating freighter and see fog, rain, and a thunderstorm. THE CASINO is based on the Arabian Nights theme. 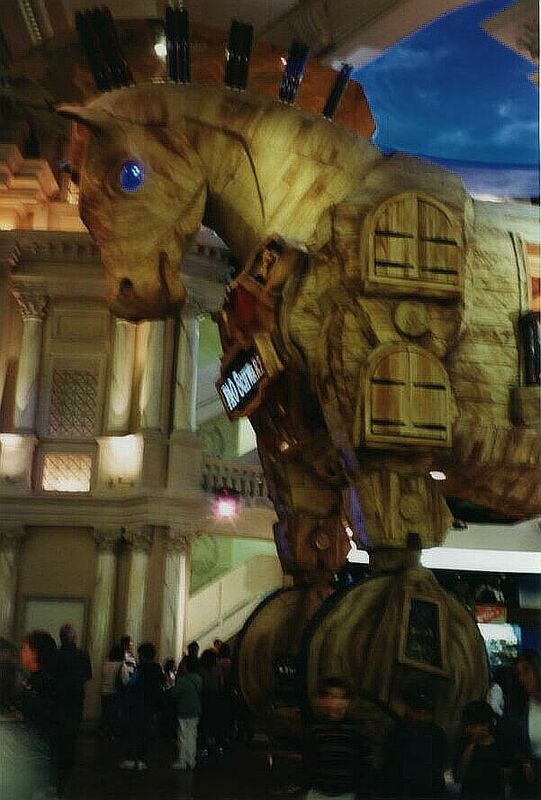 There are flying carpets, magic lamps, winged horse sculputures and murals throughout the casino area. At the FRONT of the resort is Aladdin's palace sitting on top of a mountain. A waterfall cascades down the mountain. (my Aladdin web page). ** UPDATE 2007 - Now called PLANET HOLLYWOOD - major changes were made to the exterior and interior as well as the shopping area ; the Dessert Passage is now The Miracle Mile Shops. BELLAGIO - More than a thousand swaying dancing FOUNTAINS shoot out of the lake that is in front of the Bellagio Resort and Casino. 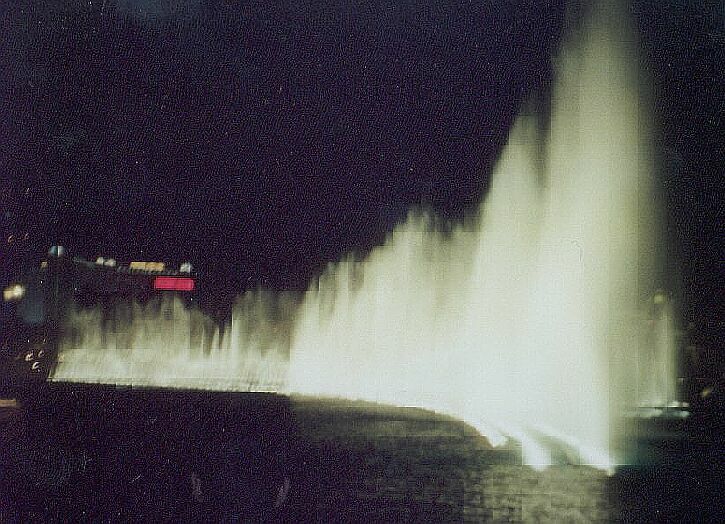 The choreographed fountain shows occurs every fifteen minutes or every half hour ( depending on the weather and the time of year). 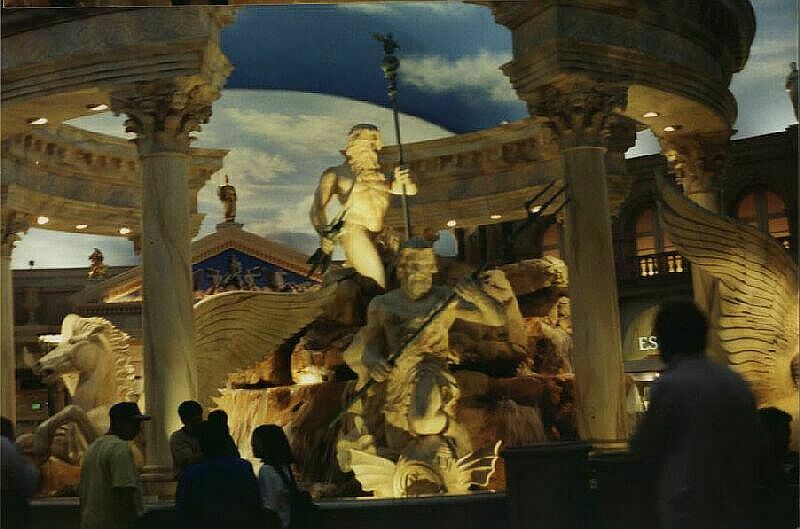 CAESAR'S FORUM SHOPS - This unique shopping mall transports you back in time to ancient Rome. Relax by fountains, admire the statues , browse in unique shops and watch the sky changes from day to night. Check out the world famous toy store - FAO Schwartz. At the Roman Great Hall there is a 50,000 gallon aquarium where they claim to have more than 500 tropical fish (including flounders, rays, puffers and sharks) in the aquarium. CIRCUS CIRCUS - Circus acts are featured daily on the Midway Stage. FREMONT STREET EXPERIENCE (in downtown Las Vegas) Four blocks are made into a pedestrian mall covered with a canopy of more than two million lights. 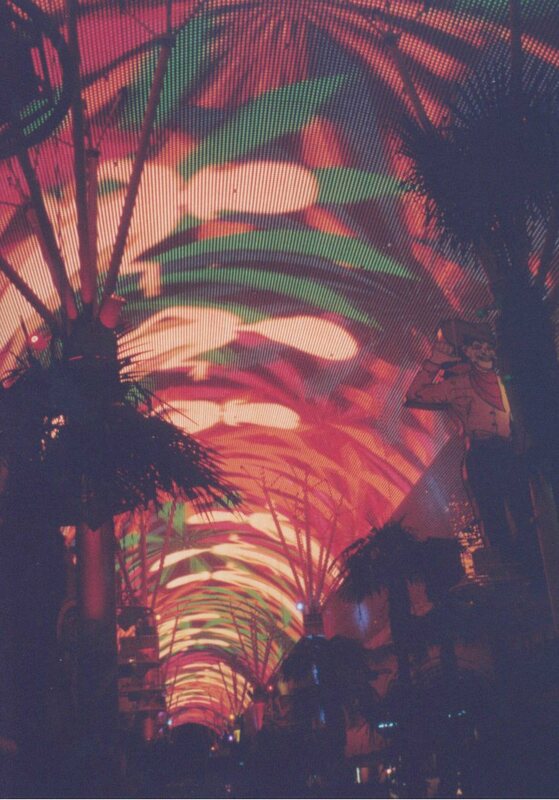 A free colorful light and sound show is displayed on the canopy. Shows start at dusk. Shows include Las Vegas Legends, Odyssey, Country Western Nights, Heartbeat of a Planet, the Rescue and Dancing in the Street. There is free entertainment and on special occasions there are stages set up with bands/groups providing entertainment. IMPERIAL PALACE AUTO COLLECTION - (free if you can find a coupon in a magazine) more than 200 antique and classic cars and trucks. Some of the cars belonged to celebrities and world leaders. 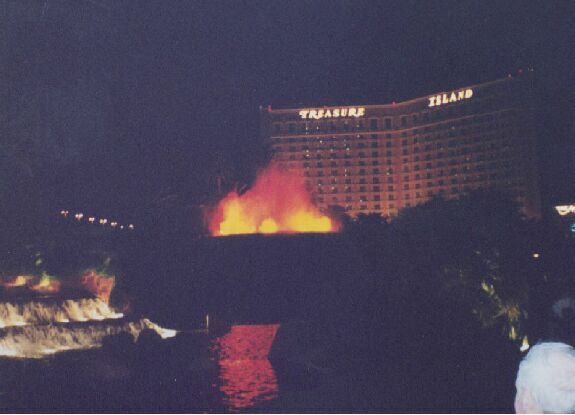 MIRAGE - a 54 foot VOLCANO erupts in the center of a lagoon filled with waterfalls, palm trees and lush landscaping. 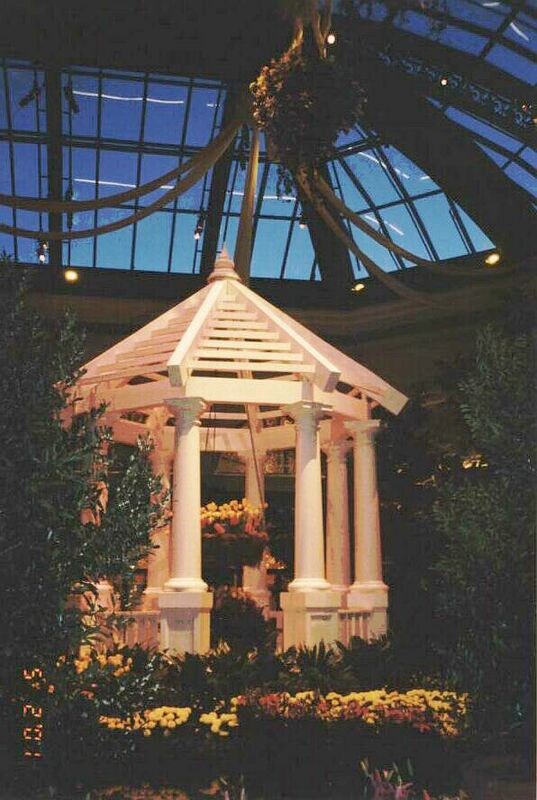 -A TROPICAL RAINFOREST grows under the high dome. There is a path leading through a forest of beautiful flowering plants, trees, waterfalls and pools. - At the front desk there is a huge AQUARIUM stocked with angelfish, pufferfish and other sea creatures including sharks. There are coral- reef species from parts of the world including the Red Sea, the Caribbean, Australia and Hawaii. The tank is 53 feet long, 8 feet high and 6 feet from front to back. RIO'S MASQUERADE VILLAGE - "Masquerade Show in the Sky" features a colorful parade of floats with dancers in exotic costumes and masks. 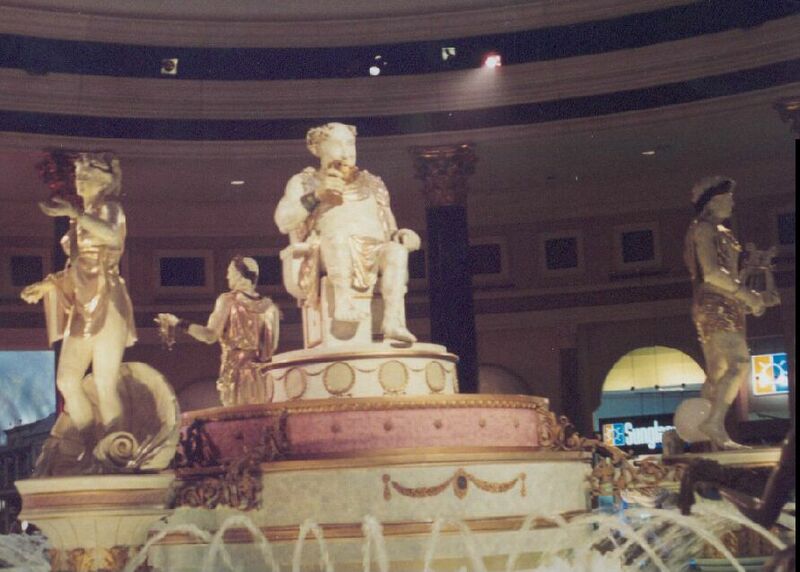 There are four different shows which float above the casino floor. The floats travel on a track suspended from the ceiling. Try to get a spot on the upper level for a good view. 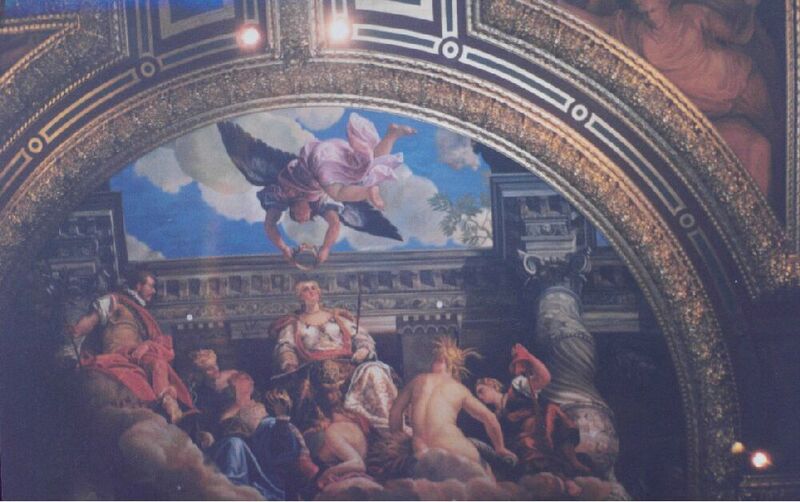 Entertainers perform on the floats and on stages which drop from the ceiling or rise up from the floor. STAR TREK at the Las Vegas Hilton has a re-creation of the promenade from "Deep Space Nine" with Quark's Bar and Restaurant. Shops feature "Star Trek" merchandise. You might see a Vulcan, Bjoran, Kilingon or a Ferengi.